Bangor: Accommodation, Attractions, Activities, Going Out, Shopping, Things to Do, Places of Interest, Outdoors, Bangor Holidays, Bangor Area Location, North Wales. The Bangor area has many exciting things to experience. The many museums, shops, theatres and night clubs in the area offer a wealth of interesting things to do and see. Explore walking and hiking trails and dozens of great lakes and ponds that offer some of the best canoeing, kayaking, waterskiing, and fishing. There is a wide range of accommodation to choose from. Bangor is a centre from which many widely varied activities and attractions are within easy reach. 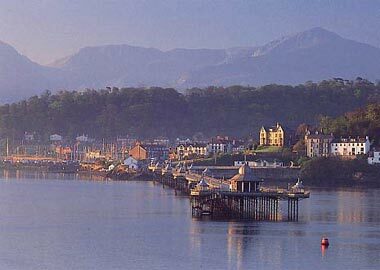 In Bangor itself there is the Cathedral, the University Building and the Pier. Penrhyn Castle displays splendid interior decoration, furniture and contains an important collection of old master paintings. The Castle is surrounded by spectacular views. The Industrial Railway Museum is well worth a visit. For the more active there are walks on the Snowdonia range of hills ranging from the more leisurely stroll to the rock faces requiring the skills of the experienced mountaineer. For those venturing to the hills any effort will be handsomely rewarded by the magnificent views. The Aber Falls descend from a height of 70 metres of which the last 40 metres is sheer overhang drop. A good view of the Menai Strait can be obtained from the top of the Marquis of Anglesey's Column in Llanfair PG. The Sea Zoo displays all the marine life to be found in the area. Of historical interest the castles at Beaumaris, Caernarfon and Conwy provide insight into the way of life during the 13th and 14th centuries. The Welsh Slate Museum in Llanberis provides a fascinating insight into the slate industry and into a bygone way of life. Almost adjacent there is the more modern type of industrial development as displayed at the Dinorwic "Pumped Storage Power Station" which is well worth a visit. Also in Llanberis, there is the Llanberis Lake Railway along the side of Llyn Padarn and also the Snowdon Mountain Railway. 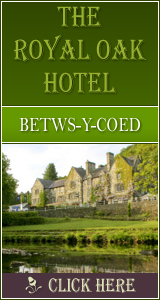 Plas Dinas Country House, Hotel and Restaurant near Bangor. Special Offers on Accommodation. Attractions of Snowdonia The Fun Centre, Castles Of Snowdonia, Electric Mountain, Talyllyn Railway, Snowdon Mountain Railway and more! St Deiniol Golf Club Course Facilities, Accommodation, Location and Information. Gwynedd Council Services Visiting and Recreation, Sport & Leisure, Tourism Information. Countryside Council for Wales Places to Visit, National Trails, National Nature Reserves, News and Events.